Temples weren’t just places of worship. A close scrutiny of Indian history would reveal that temples acted as centers of excellence to several fields and were particularly instrumental in nurturing music and dance. Classified as temple arts, music and dance enjoyed patronage through temples for several centuries. While the political and sociological changes did affect every walk of life, traditional temple music continued to thrive in the nooks and corners of the country. The evolution of musical instruments reveals that the roots of most instruments can be attributed to the purpose of announcement — a drumbeat announcing a ritual or a blowing of conch announcing a deity in procession, etc. Latter-day sophistication resulted in creation of more melodic instruments. The repetitive monotones were replaced by contours of vibrant music. Temple music reached its pinnacle with the arrival of Nagaswaram. The daily rituals and various occasions provided ample opportunities for Nagaswaram artists to hone their skills and exhibit their mastery. While the delectable music demonstrated artistic creativity, with time certain core musical values were crystallized to form new traditions. For example, during the yearly temple festival (called Thiruvizha) that ran for over ten days, the Nagaswara Vidwans were expected to play appropriate pieces according to the day, time, position of the deity during procession and the occasion. The newer entertainment entrants such as radio and television resulted in lesser number of connoisseurs for the traditional temple arts. The classical music rejuvenated itself mostly in the cities through newly formed organisations called Sabhas. The artists who aspired to make a living through the art were forced to move out of villages. The temple centric music transformed into people centric music. The Carnatic music became composition centric with the creative aspects became extension of compositions. The political and sociological changes in the first half of the twentieth century have had several positive and negative impacts on the society. One such negative impact is the discontinuing of meaningful patronage of temples. In most temples, the appointment of temple artists is purely perfunctory – done with no consideration to music, tradition or meaningful livelihood; they are just nameless placeholders. The carefully chiseled out traditions have suffered a slow death. Today only a handful of temples possess anything hearkening back to the glorious traditions. One such rare location is Chidambaram in Tamilnadu. Chidambaram is a unique place as it is considered sacred by both the Saivaites and Vaishnavites. 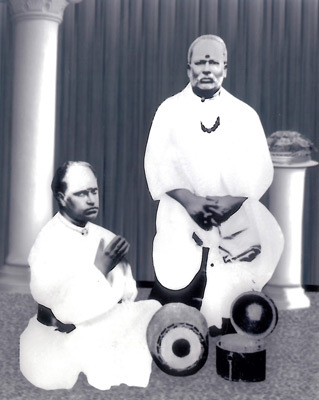 Separate Nagaswaram traditions exist for both the Saivaite and the Vaishnavite groups. While musical pieces like the Mallari, played during procession or part of daily rituals are mostly common in both traditions, differences exist especially during the yearly temple festivals. This author has extensively worked on documenting the Saivaite Nagaswaram tradition of this temple. The pieces that are played on the 11 days of the festival were meticulously recorded in the form a DVD titled “Nadamum Nadanum” with a commentary from Dr. B.M.Sundaram – an authority in this subject. The pieces were played by Vid. Achalpuram Chinnathambi Pillai (now 90 years old), who is incidentally the currently designated Nagaswara Vidwan of the Chidambaram temple (Asthana Vidwan). He comes from a lineage that boasts of generations of artists that have served as Asthana Vidwans. It is not an exaggeration to say that he is the last straw that is holding this tradition together. If efforts are not made to document this tradition through this rare artist, we are at great risk of losing one more glorious tradition forever. In this proposal, we intend to document the Vaishnavite Nagaswaram temple tradition. During Navaratri, the yearly festival for the Vaishnavite deity Govindaraja Perumal is conducted. The Nagaswara artists are expected to play a specific set of musical pieces and songs during the ten days of the festival. 4. Travel expenses for the project coordinator, artists, production crew, etc. The estimated expense is five lakhs and we have already raised about 1.2 lakhs for this purpose. We request you to assist us in the form of a donation so that we could document this worthy tradition for posterity. We intend to get the filming done on the last week of March 2018. Absolutely there is no doubt “Nathaswaram” should be given that importance. This is ‘MangaLa’ vaadyam people will say. Its importance one can see generation after generation.